To ensure content is accessible to the largest audience possible, organizations are implementing dynamic publishing solutions for the creation, repurposing, and delivery of content. These dynamic publishing solutions will become increasingly valuable to content creators looking to address the largest audience possible. 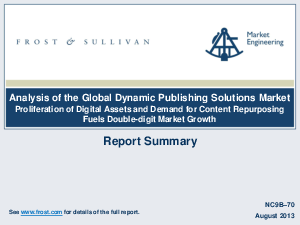 In their recent report, Analysis of the Global Dynamic Publishing Market, Frost & Sullivan examines the substantial adoption of dynamic publishing and the impact dynamic publishing is having on enterprise organizations. According to the report findings, only a few vendors in the dynamic publishing space offer an end-to-end solution, including structured authoring, design and a complete platform for the management and delivery of content. The growth of the global dynamic publishing market is shaping the way organizations will develop streamlined enterprise content management strategies, keep up with shifting end-user content consumption trends and acquire the best solutions for scalability, output and ease-of-use. Learn more by downloading the most recent Frost & Sullivan Dynamic Publishing Market Report.